Executive Summary With a rising trend in men purchasing and experimenting with new fashion styles, the menswear market is set to go on an upward trend and might overtake womenâ&#x20AC;&#x2122;s wear one day. This is all thanks to social media and menâ&#x20AC;&#x2122;s changing habits. While the menswear market looks promising, retail has been on a decline. But is the decline truly reflective of consumers shopping less? The answer is no. As consumers evolve so have their habits, and the bridge between online and offline are blurring. Retailers must connect the bridge and create a seamless experience. This is what Order aims to bring to the table. Order is a menswear brand who will launch in Singapore. Bring the very best of its minimalist designs which last beyond seasons to a its target market of educated gentlemen who discuss quality and design before price. Order will most likely operate in a favourable environment if it adopts the current strategies of omni channel and experiential retail. With the COS fashion brand doing well around the world, it would be smart to ride on its success. As with any business, Order plans to expand after the first 3years. Opening 1 more boutique and expanding its presence overseas. Although the company require investments from external parties to fund its start-up, based on financial statements and forecasts, it shows to be a profitable business. In Singapore, consumer spending has increased to 38850.5 SGD Million in the fourth quarter of 2018, up from 38374.4 SGD Million in the previous quarter in 2018, and that is some good news. (Trading Economics, 2019) The statistical figure is shown below. The apparel industry in Singapore has achieved an entire sales figure of S$4.4 billion, with a stream of suppliers for international brands such as Gap, Nike and Macyâ&#x20AC;&#x2122;s. Local fashion brands like Charles and Keith have also received continuous worldwide recognition, turning into into international brands itself. (Enterprise Singapore, 2018) Based on the information provided by Department of Statistics Singapore, Real GDP Growth in 2018 was 3.2%. (Department of Statistics Singapore, 2019). Favourably, wholesale and retail trade makes up 18% of the nominal GDP in Singapore. There are not many legal challenges found in Singaporeâ&#x20AC;&#x2122;s fashion retail industry, where ethics and compliance mainly impact larger key players such as H&M and Zara. Labor laws and other business laws will continue to affect brands to conduct their operations in compliance with the various laws existing in Singapore. Secondary Market Research Consumer Behaviour With an expansion of the menswear market highlighted in the previous chapter, it could largely be attributed to social media’s role in building visibility around men’s fashion, lifestyle changes and accessible e-commerce. With a robust growth in the menswear market, an increasing number of retailers are focusing their attention on men’s clothing and targeting this category to generate sales. With that in mind, there is a multitude of untapped opportunities as an apparel retailer as men become progressively invested in their personal style. These trends and research statistics indicate substantial evidence that launching a menswear clothing brand in Singapore targeting men in the age range of 22-34 will allow it to operate in a very favorable environment. Primary Market Research Consumer Behaviour The Target Customer: A typical Order customer is a university student or working professional belonging to middle and upper management ranging from the ages 22-34. They are educated, creative, cultivated in their interests and highly individualistic and self-motivated. Having a keen sense of style, they are constantly experimenting with their image. Competing for upper and middle-class discretionary dollars in the fashion market. They belong to the ‘’Millenial’’ demographic range. Whom are actively connected through all forms of social media, tech savvy, socially concious and demand instant gratification. Below is a customer profile which highlights the characteristics of the key type of customer for Order. According to primary survey conducted, it has debunked the myth that men in the (22-34) age group of an educated background don't like shopping for clothes often. This substantiates the forecasted growth in the menswear market. Although these men are more likely to shop offline, online shopping is gaining traction and catching up. They prefer taking a logical approach of researching thoroughly a product over online channels before planning a purchase. They are willing to spend on average $88 on a piece of clothing and are open to new brands without a need to follow trends. Their preferred shopping destination in the city is Ion Orchard and they tend to shop with their partners and friends. They are influenced by social media and celebrities with a penchant for music and sports. Priorities in clothing are quality, comfort and an emphasis on minimal/sporty styles. - To launch a menswear brand which sells quality minimalistic designs - Retail store location to be in Wisma Atria - The brand will take an omni channeled approach: connecting the physical store, online store, social media platforms and mobile applications. - The physical store will be experiential in tune with music and sports. - Celebrity endorsements and influencers for advertising. - Promotions based on who they shop with and how they shop. These factors will be applied in the later chapters of this report. The arrangement or disposition of people or things in relation to each other according to a sequence, pattern, or method. The three principles of Order are sequenced: Modern, Practical, Considered. A quiet rebel in a world of high street and flash, Order is a menswear brand whose products exercise a minimalist approach, not overworking designs. Garments are made to be timeless and worn beyond the seasons. Made for individuals who value the subtle details and patterns scattered across this vast universe. From a design standpoint, Order believes that beauty is important alongside practicality. Designs draw inspiration from simple geometric shapes ranging from the likes of rectangles, circles, triangles and even simple lines. Geometric shapes are the ones we first learn about as little kids. They're the simplest, most common shapes of all: Most geometric shapes are symmetrical and instantly recognizable, a fundamental building block of our lives. Be it from large visible shapes to tiny lines on a garment, these fundamental structures will be incorporated into each and every piece in some form or another. Order does not make mass-market products. Distinct products for distinct people, each of its products has its own explicit profile with each its own explicit job to do in the market. In short, Order puts a twist on fashion staples. The following two pages illustrates the Colour Board, Mood Board, Design Inspirations & Final Concept for Order. Business Model Order has a dream for a cohesive retail experience, where technology can improve efficiency and create seamless platforms to connect to customers. Order will have a store of the future. A retail resolution that links online and offline channels, using data to augment and generate a unified buying process for customers. Competition, Positioning & Pricing Order’s competitors are determined based on similar design aesthetics, price range and target market segment. This portion of the report will focus on two main competitors – BLACKBARRETT and COS.
BLACKBARRETT will be Order’s upscale competitor. They have a flagship store located at Paragon Singapore. 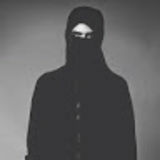 The Neil Barrett fashion brand has been at the forefront of minimalist menswear, delivering innovative and distinctive designs, blending sartorial and athletic elements. The hallmarks of the label are modern interpretation of timeless staples, masculine and ageless with acute attention to fit, fabric development and accurate detailing. BLACKBARRETT is Neil Barrett's second line collection and is an extension of his main line. The brand carries the DNA of his mainline fits, offering a comprehensive wardrobe from an accessible price point. BLACKBARRETT shapes seasons with collections of modern sartorial staples, with an aim of creating a contemporary and timeless wardrobe. Typical average prices range from $160 for T-shirts and tops; $520 for outerwear; $220 for shorts and pants. COS will be Order’s main and direct competitor. H&M’s business has not been doing well, but other its other group brands have been performing better, according to the company’s CEO, Karl-Johan Persson. One of such brands is COS.
Cos, which was launched in 2007, is a brand focused on minimalist designs sold in a modern environment. Delivering a range of reinvented classics and wardrobe essentials, they create pieces that are made to last throughout seasons. Traditional approaches and new practices combine to form timeless, understated collections. Since their launch, COS has opened stores worldwide in sensibly measured locations, applying an architectural design concept that preserves a buildings original features whilst creating a modern, welcoming space. COS also managed to find the missing link and gap in the fashion market: Design quality apparel at an affordable price and this success is helping to make up for H&M’s unsatisfactory run. Its strategy contrasts its sister brand, of whom attempts to follow trends and sell a profusion of styles in stores. COS is Located at ION Orchard and Jurong Westgate in Singapore. Their prices for tops range from $49 to $359 and bottoms from $109 to $159. 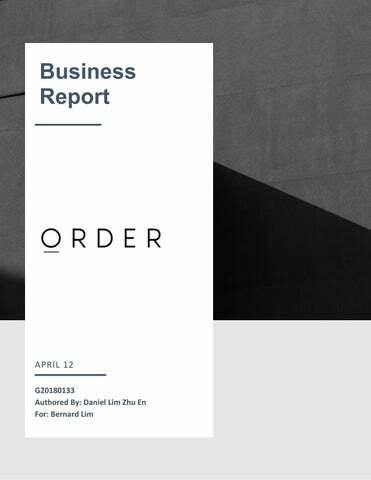 As a new brand to the market, Order is aiming to achieve a strong brand equity with its minimalist designs and subtle creative twists. With a launch in 2019 where social media and the internet can aid in gaining brand exposure, opportunities are boundless. However, with its slightly pricier price tag than brands such as H&M, Topman, Zara or even Uniqlo, it may fall prey to budget constraints and the economy. The company will require 6 monthsâ&#x20AC;&#x2122; worth of inventory as start-up inventory. Based on Sales Forecast, from January to June, the cost of goods required is $67,250 in total. A basic renovation to the aesthetics of the retail store is estimated to cost $15k. Start up cash required would be about $7,500. Hence the total startup funds, based on the figures shows to be $190,238. Summary of Financial Analysis This is a summary of the complete financial analysis. For individual detailed financial statements, please refer to appendix 3 of the report. Looking at sales forecast, the net sales profit for the next three years proves to be optimistic. Year 1, 2 and 3 net sales profit are noted to be $390,000 ; $468,000 and $561,600 respectively. This is an increase of 20% every year with the assumption that sales improve due to increased brand awareness and referrals from existing customers. The average breakeven per month is estimated to be $28,853. If you look at the net earning per month under the monthly income statement, the total annual net earnings for the first year is recorded at $76,743, after deducting all operating costs and expenses which also included employee wages and depreciation of equipment. Expanding further into three years from business operation, the net earnings are notably increasing over the years, from year 1 at $76,743 to year 2 at $89259 and to year 3 at $163,840, a significant increase in net earnings throughout 3 years. Branching into cash flow which addresses the cash liquidity of the business operation, the annual cash balance proved to be a comfortable and well supported figure. At the end of year 1, cash balance is estimated to be $205,468 and in year 2 $533,936 and in year 3 at $987,204. These figures confidently reassure any investors or participating shareholders of the viability of Order. In summary, the viability of Order proves to be optimistic and favourable. Despite facing a few low peak months which directly impacted the net earnings per month, the business can recover total higher net earnings at the end of the year. Sales revenue are expected to increase over the next 3 years, and the company will continue to enjoy higher cash liquidity as the business blooms in the next few years. Production Plan In the first few years of operation, Order will begin producing and outsourcing manufacturing to devoted service providers. The company will set up a proficient supply chain management that allows reduced costs and delivering flexible and punctuality. Supply chain management is a major component for new fashion labels. Good supply chain management entails close communication with suppliers, warehouses, logistics firms and the client. To do this, Order will employ BrydenApparelâ&#x20AC;&#x2122;s services. Bryden is a Singapore based company which serves independent fashion labels, big companies and ecommerce retailers with sourcing and garment production requirements. They are able to handle the entire supply chain process from designing, creating tech packs, sourcing for fabrics and trimmings, creating samples, bulk apparel production, packaging, quality control valuations to placing delivery of the products. Specs & Costing Line Sheets are integral to any fashion business or brand looking to wholesale their collection. It is a sales tool created to communicate necessary information about the product to a potential stockists. Unlike a look-book, the line sheet provides an easy reference for a buyer looking to place an order. A sample line sheet has been drafted for future use should the sales and distribution strategy change. Costing sheets have also been drafted to illustrate the fabric usage and details relating to garment production. Retail Business Overview Before venturing into the retail business of a given country, an analysis must first be done to check for a suitable environment. Wisma Atria, a mall that is strategically placed along a major stretch of Orchard Road between ION Orchard and Ngee Ann City, appreciates a huge stretch of prime street facade and is a renowned landmark to both locals and tourists. Wisma Atria enjoys a high human traffic flow due to its Orchard Road front and an underground pedestrian linkway which connects Wisma to Orchard MRT and Ngee Ann City, allowing for ease of access. Why Wisma Atria? As a new and emerging fashion player to the market, Order must capture an audience by developing an initial buzz or following. Choosing a strategic location is vital. With COS situated at ION and BLACKBARRETT at Paragon, placing Order at Wisma Atria will position itself right in the middle of its two competitors. This will enable Order to catch spill over customers in the vicinity. Although ION Orchard was the preferred mall choice by respondents, they mainly shop around and work along the city and orchard road area. With Wisma being in such proximity and accessibility to ION, it should not be an issue. Furthermore, the benefits outweigh the cost of placing the store at ION. By situating the store in Wisma Atria, it can achieve a significantly larger floor area as compared to ION at a more affordable price. Order requires a larger space to house its components to give its customers an experiential retail experience. ION was offering $40.62 SGD Psft, while Wisma was offering $29k SGD for a 1700Sqft store space which would equate to $17.05 SGD Psft. With the assumption of a budget of $20k, Order could procure a shop space of 1100Sqft easily, which compared to ION would only yield 500Sqft. Retail Theatre Omni-channel retailing is about providing consistent, unique and contextual brand experiences across multiple customer touchpoints, including brick and mortar, web, mobile and social. To achieve this requires a simple philosophy. Hence there is an additional purchase of $6320 for June and $7075 required for December. No extra purchases needed for the other ten months. Stock Allocation In-Store As a new brand, it is not possible to estimate the right amount of sizes allocated to each piece of garment for sale in store. Therefore, a rough guide in the assortment plan below will be used as a standard for the business in the first year. After which, it will be possible to track customers buying patterns and draft a new assortment plan for the following year using retail data analytics and sales patterns. Matching supply and demand in the future. The ratio of tops to bottoms and outers are derived from forecasted sales figures and are subject to modifications in the future. Marketing Plan After launching a brand and having a retail presence, marketing and promotion is one of the necessities for getting a brand in front of the public and attracting new customers. It is an important aspect regarding generating of sales and awareness for a new fashion label. Upon the launch of the Order store, a product party would be held at the store itself. Prior to the party, invites are to be sent to various people in the industry, potential customers and celebrities. Have products on display at the party so that interested customers can buy easily. Conventional advertising is generally costly and not a definite way of generating sales. For this, advertising for Order would only consist of utilizing influencers. Basically, send out clothing to fashion influencers to wear and do a review about it on their social media page with details of the brand and where to buy it. Because of how good the clothes usually look on the influencers and that people believe that these influencers are the encyclopedias of fashion, sales and brand awareness usually follow suit. Conclusion & Recommendations Launching a new fashion brand doesnâ&#x20AC;&#x2122;t come without risks. But with a well analysed report, we can mitigate those risks. Increase its chances of success in this volatile retail market. With an expanding menswear market and a consumer preference for omni-channel retailers, Order might just launch itself into the warm and receiving hands of consumers. Based solely on financial statements and forecasts alone, Order looks to be a profitable fashion business in the long run. For Order to truly succeed, it must take steps to ensure customer satisfaction. Keep up with the trends, observing the ever changing behaviors of customers and cater to their needs. Feedback and criticism plays a huge role as well. Order must keep up with the supply and demands in the market of consumerism. Competition is stiff, and Order has to stand out. The information in this report is tentative to the current launch only, and is subject to changes from marketing to retail strategies. Even price points can change with time. Nothing is for certain. As long as Order maintains a strong oversight into market and industry trends, it can always be the first to strike before its competitors. Sports and music dominate over 60% of the chosen hobbies, with 70% taking inspiration for purchases from social media platforms, of which are inspired by a celebrity. Sport celebrities/athletes or musicians can be used to endorse clothing as a form of advertising. From promotions that tie with sporting and music labels, to an instore experience featuring apps such as Spotify. Create shoppable content on social media platforms with targeted ads. Social only discounts for friends who purchase multiple items. Provide status updates about new drops, connecting the customer to the brand. Quality and style are the top-rated components of a garment. With comfort coming in at 3rd place. This keeps in line with what respondents in this segment are willing to pay which serves as a good estimate. 60% of respondents prefer ion orchard as their shopping destination. Thus a switch of store location will be considered. This is to ensure that we capture our target audience. As today consumers do all their prep onlineâ&#x20AC;&#x201D;reading reviews, exploring alternatives on social media, finding the best discountâ&#x20AC;&#x201D;which means less time spent going around stores and lesser unplanned purchases. A brand has a week to capture the attention of the consumer before he changes his mind. The company will require 6 months worth of inventory as start up inventory. Based on Sales Forecast, from January to June, the cost of goods required is $67,250 in total. A basic renovation to the aesthetics of the retail store is estimated to cost $15k. Start up cash required would be about $7,500. Hence the total start-up funds, based on the figure above shows to be $190,238 Long term assets are estimated to be worth $15,000, including furnitures, equipments and patents Prior to business opening, we will be engaging in marketing campaigns and activities which include public relations, packaging and designing of apparels that are estimated to cost about $11,880 As deposit of 3 months worth of rental deposit must be made prior to business opening, the rental deposit is calculated at $20k per month, in total of 3 months = $60k. Net sales profit is noted to be $390,000 in year 1, $468,000 in yr 2 and $561,600 in the 3rd year. The above sales forecast shows that 1/4 of net sales is estimated to be the cost of goods sold. Daily week sales are forecast to be $1480, on weekends expected to increase 20% in sales to $1776. High sales volume months are recorded on Janurary, February, June and Decemeber. Low sales volume months are recorded on April, May, August and September while average sales volume months are recorded in March, July, October and November. On peak months, sales revenue are expected to increase by 20% at $53,000 compared to average sales revenue at $44,000 and low sales revenue are expected to decrease 20% of average sales revenue per month at $33,000. Assuming that the variable cost is 20% of the total sales revenue, given from monthly income that the observed fixed cost per month is calculated to be $23,082. It is noted that if you cross reference to the variable cost per month found in the monthly income, which should be about $2238, there is a huge difference to the estimated variable cost found in this break even analysis section. It can only be justified that the fixed cost is used as a reasonable basis instead of the variable cost found in the monthly income statement only because fixed costs are quanitifiable whereas variable costs depends on the amount of goods or services used or purchased each month. Therefore, the amount of revenue needed per month on average to break even is calculated to be about $28,853. University Of East London, CW3.